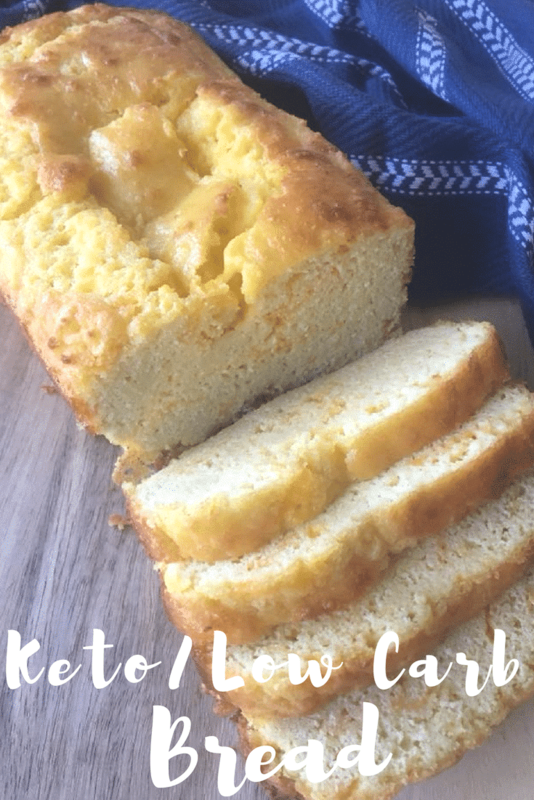 If you want a Low Carb Keto Bread Recipe that feels and tastes like regular bread, this is it! Of course, it isn’t going to be exactly like your traditional bread recipe, but it is as close as they come! Perfect for a side to dinner as well as making sandwiches, just make sure to follow our tips for toasting before eating! I’ve had so many people ask if they could cook my 90-Second Bread in the oven, or if they could prepare multiple batches to last for several days. After I multiplied my 90-Second French Toast into a large loaf, I knew I could do the same for 90-Second Bread. I increased my original recipe several times and made the perfect sized loaf that cooked fabulously in the oven. As always I am going to be 100% honest with you. 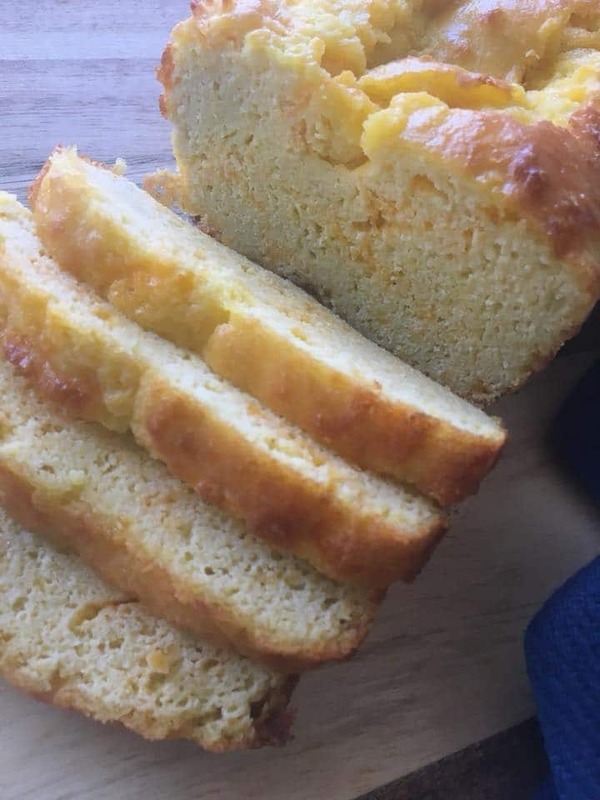 Just like my 90-Second Bread, I would not suggest eating this Keto/Low Carb Bread straight out of the oven. Instead, cut a slice and fry it in a skillet in butter or toast it up in a toaster oven or air fryer. I don’t know why this step makes such a difference but I promise it does. I’ve heard of so many people saying they hated 90-Second Bread until they found my version and it totally changed their opinion. Still, the key is doing something after the bread comes out of the oven to crisp it up. Otherwise, it does taste eggy. However, once you crisp it up it will knock your socks off. If you aren’t already following my Easy Keto/Low Carb Recipe Page on Facebook where I post all my new recipes, you can join here and follow me on Pinterest here. I am always sharing great tips on how to make this lifestyle work better for you. I have recently shared about healthy fats to use for the keto diet. When in doubt about the plan, you may also want to read about these benefits of the keto diet. So many are curious about why I chose this diet, and these share a lot of information on how it is a healthy choice. If you are just getting started following a keto diet and would like more information, there are tons of fantastic resources. Amazon has several great books you may want to check out here. Melt butter and set aside until it is room temperature. Once butter is room temperature add all other ingredients and stir to combine. Grease loaf pan or line with parchment paper. Pour batter in a loaf pan and cook for 45-50 minutes or until a toothpick inserted in the center of the loaf comes out clean. Before serving, fry each slice in butter in a skillet or toast in the air fryer or toaster oven. This step is key to a piece of great tasting bread. 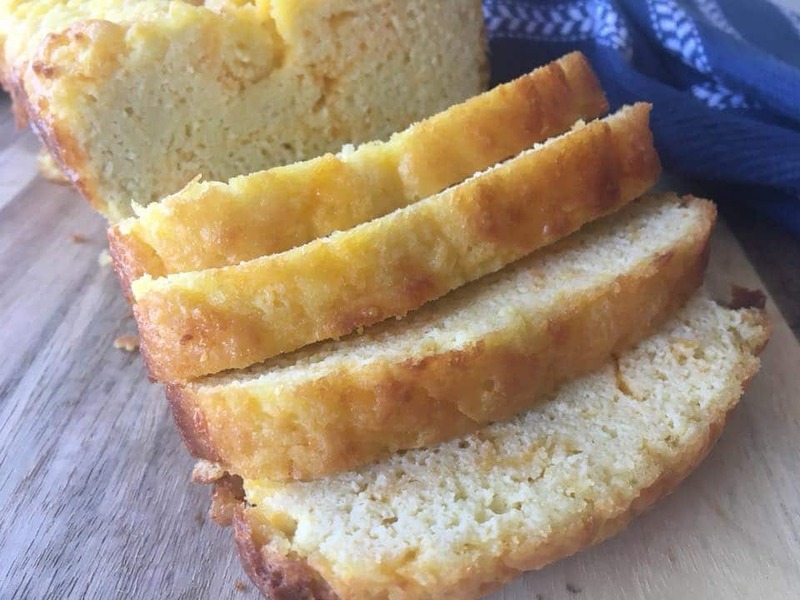 I’ve been experimenting with making keto bread recipes for a while now. I’ve come up with some popular choices that are a perfect substitute for regular bread. If you want more variety of keto recipes, make sure to check out all of my Keto/low carb recipes in my Keto/low carb recipe index. I love your page and recipes! Do you ever sub almond flour for coconut in the bread/ muffin recipes? I made this recipe with 4 cups almond flour. No coconut flour. I despise the stuff. That was the only change in the recipe. It turned out very good. I will say I need to add salt. Definitely boosts the flavor. I’m glad the almond flour worked for you. My oldest daughter is severely allergic to almonds so I have never used it. The bread is cut into 14 equal slices and the nutritional info is per slice. 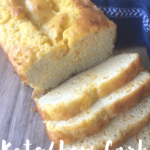 In this Keto/Low Carb Loaf Bread recipe it shows the nutritional amounts per serving but doesn’t say what a serving is. Could you tell me how much is a serving? Oh, I see. Cut it into 14 slices and each slice is a serving. So, any kind of sandwich would be 2 servings. It is cut into 14 pieces. Can you tell me the serving size to your low carb bread, please. I can’t wait to try it! The macros are included per slice so that each individual could determine their own serving size. I would think it would keep a couple of days. I’ve been looking for a bread that is lower in carbs, so thank you, I can’t wait to try this! One question, could I leave out the cheddar cheese from this recipe? You certainly could, although I can’t guarantee what the outcome would taste like as I haven’t tested the recipe like that. Love this! Just finished baking it, and was wondering— how long would this keep on the counter with cling wrap? Do I have to put it in the fridge? Thank you for this great recipe! I put it in the fridge personally, but you can do whatever you prefer. Sure! Glad you enjoy it. I made this tonight and oh my goodness. Toasted is where it is at! I sliced mine up into 14 servings and froze then into individual baggies. I think it would keep longer this way. So glad you loved it. That is a great idea. That sure is a lovely looking loaf of bread in your pictures! Can you please tell me what size your loaf pan is? I have several different sizes and I want to be sure my loaf looks as tall as yours! I don’t know the measurements. It is just a regular standard loaf pan. I can’t believed this bread this bread is so good. Even my husband like it. Thanks for sharing the recipe and your tips. You are so very welcome! I’m glad you enjoyed it. Could you substitute greek yogurt for the sour cream? I’m not sure I’ve only made it as is. I’ve not tried baking with greek yogurt. I love your receipts, they are great! Is there anything I can substitute eggs with? At least part of them? Thanks so much. I’ve only made the recipe as is so I’m not sure. OMGosh I just used 2 sticks of butter ? do you think this will still come out? I hope so, but I’m not sure.